This is an example of how to ruin an air conditioning system. These flexible air ducts are not installed correctly. They cannot lay on each other, ducts will collapse, and they must be pulled tight. Which Type of Ducting is Better? We are here to help you make the right choices for an air conditioning system that performs the way it should! 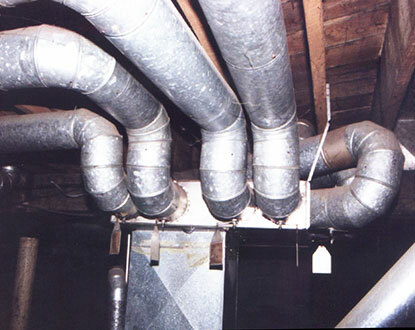 Metal ducts are seldom installed correctly. This system seems on the surface to be just fine, but a little in depth observation shows a system that is horribly inefficient. Most air conditioning system are designed to have as little static pressure, airflow resistance as possible. The number of elbows in this picture creates a significant amount of airflow resistance. I sheet metal 90, as shown in the picture here, has the approximate equivalent of 10 feet of ducting in static pressure. When two 90 elbows are put next to each other the equivalent distance jumps to past 60 feet and when a third is installed less than 2 duct diameters the distance jumps to past 80 feet. It jumps even more when we calculate in the sheet metal plenum resistance. This ducting has about the same static pressure resistance as 100 feet of straight ducting. That correlates into less than ½ the airflow these ducts should be pushing. Look at the joints. None of the joints have any sealant of any type on them. Most sheet metal ducting coming in 36” lengths. That means that every 36” of run, plus every 90, there are leaking air through the ducting. Sheet metal ducts have a much greater potential for air leakage than flexible ducts. Sheet metal ducts are used in homes in garages and through firewall penetrations. They are also used in long transitions between floors and in wall cavities. Once the ducting is in the attic flexible ducting should be used to reduce the number of joints and reduce the labor burden. Flexible ducting is much faster to install. 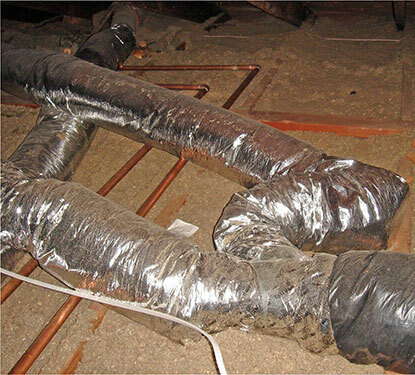 This picture of flexible ducting serving an air conditioner is an example of poor design. The transition between the single air duct to the 2 air ducts has been manufactured by the HVAC company. This is made from duct board. Duct board is a hard fiberglass sheet with a mylar coating on it. These types of duct board transitions increase static pressure through air turbulence dramatically and have a tendency to leak air. The couple of dollars saved here ends up costing the homeowners in terms of cooling and comfort. 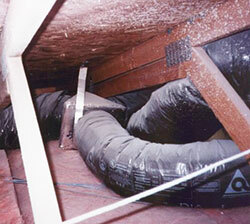 If your air ducts are leaking air your home is operating in a negative air environment. These means that your home is sucking in dirty contaminated air from every crack and crevice in your home. This defeats even the best indoor air cleaners. If you are not going to seal your air ducts, don’t bother with a whole house air cleaner. It just won’t work properly. They arrived on time, worked hard and completed the job in less time than I was originally quoted. My husband and I have been in the restaurant industry for over 20 years, and truly your company is the best we have ever been involved with. Keep up the great work and Good Luck in your future. This was a complex job and was done professionally from start to finish.